Dublin Chamber is Ireland’s largest Chamber of Commerce in Ireland, with more than 1,300 members employing 300,000 people nationally. Organisation will lead a mission to London in the autumn and will work with the Chambers Ireland upcoming mission to Brussels. Tourism Ireland CEO Niall Gibbons said the Metro linking Dublin Airport to the city centre and suburbs is vital for the expanding capital. 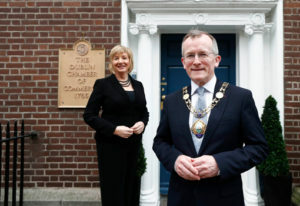 He was making his inaugural speech as President of the Dublin Chamber business association at an event in the city attended by Taoiseach Leo Varadkar, and ambassadors Robin Barnett from Britain and Brad Borgess from New Zealand. Mary Rose Burke, CEO of Dublin Chamber and Niall Gibbons, President of Dublin Chamber. Picture Conor McCabe Photography. He also used his speech at the Chamber dinner to call on Government to get the MetroLink rail system for Dublin moving. He said: “We cannot afford for the MetroLink project to be delayed. The time is now for our decision makers to take an ambitious leap in terms of the transport infrastructure needed to take our capital city to the next level. Niall Gibbons heads up the Chamber’s council, which also includes travel faces Mary McKenna of Tour America and Dublin Airport Managing Director Vincent Harrison.